I am not a political person. I've lived in Delhi almost all my life and the other Delhi, the one that buzzes with intrigue and meetings and People In Power hasn't touched my life at all. My Delhi is humdrum and daily. Unlike Bombay, where Bollywood brushes up against you whether you like it or not, the political side of Delhi stays at a distance. At the most, there'll be stopped traffic when someone major passes you by. I've been for beating the retreat at some points, but not in years, and even then, it was a pretty parade, nothing to do with this being the heart and soul of India's governance. A friend's father recently got a Big Deal position and she asked, over drinks at her house whether I'd like to go watch the swearing in. I think she just asked because I was there and I had been asking whether she'd have to move (obviously the most important of all the questions). She was as surprised as I when I accepted. "But you'll have to wake up early in the morning," she said. "But it'll be hot and boring." So, a hand delivered invitation arrived at my home, all crested with the Government of India gold seal, three lions looking in different directions. The truth shall win. I felt a twinge of something, call it latent patriotism. My mother, a former journalist, looked at me with amusement and skeptism. "I don't know what you're expecting," she said. "A parade!" I said, "A band!" "These affairs are really boring," she said. I was beginning to regret the decision already. But I had made a commitment so I decided to make the most of it. 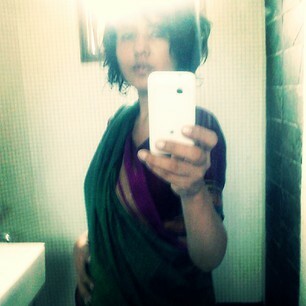 I wore a sari--my mother's when she was 16, which counted as vintage and an old style Andhra blouse, hand stitched by my grandmother, two hooks to hold it together and the rest you had to tie up at the waist, ala Britney Spears. I felt prepared, in outfit, if not in mind. I was hoping for a sight of Madam, you know Madam, the Lady Who Holds The Reins. The Lady Of The Reign even. I'm a big fan of Madam, I think it's incredible how a foreigner and a woman managed to have so much power in her adopted country, when as a widow with two kids, surely the easiest option would have been to go home and never return. Sure, she's made some bad decisions, and yes, no one wants Son Of Madam on the throne, but I think her saris are excellent. (Yes, I realise you shouldn't vote for someone based on their fashion sense, but honestly, consider our options.) I was imagining Madam being all like, "OMG I love your outfit" and then we'd chat for a bit. Going to the venue--also my friend's new digs--took a while. I began imagining future rendezvous' with her where I'd basically have to leave my house an hour earlier and then the sorrow of no longer having a friend close enough to access, but then, you guys, this house. 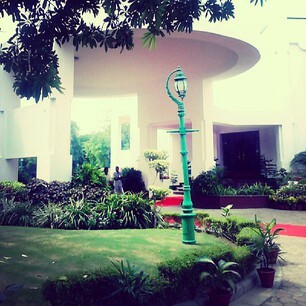 Built originally as a British Secretariat, I believe, it has some ginormous lawns, a drive in lobby and enough rooms for your entire extended family to come and stay without once running into you. I would go into the government service just for a home like that--although, I'd probably have to wait till I was about 60 to get a nice place. Here's the thing about government functions: they make you sit about 45 minutes before the whole thing begins. I wonder if I had left a little later, made my arrival by say 9.30, if I still would have gotten a seat. There were mist fans and everything, but it was sticky hot and everyone was using their invitations to fan themselves. I also realised Madam wouldn't be making an appearance, as security was not as tight as it could have been. I mean, it was tight, but not like crazy-crazy. The ceremony itself lasted for about ten minutes. The gorgeously decked out police band played the national anthem, we all stood up. The Chief Justice of India acting chief of the Delhi High Court took my friend's father to the podium, he swore to be truthful and protect the people of Delhi to his best interests. It was quite moving. All the people in power have to take the same oath, I realised then, and how they must take it, with equal solemnity. Do they forget as soon as they sit down? Do they think, "oh, needs must" and carry on with their days? "You SWORE," I want to say to them, "You SWORE to look after the needs of the people, and you're only looking after your own!" That might have been quite a political moment. Then there was tea on the lawn which was ghastly. The coffee I mean, not the lawns, the lawns were lovely, but all of these government functions, says the person who has been to exactly three, have the worst coffee in the world. "There should be mimosas," I said to a friend sitting next to me, whose second swearing in this was. "There TOTALLY should," he said, turning his iPhone backwards and taking a picture of us. "Instead, darling," I said, wearily fanning myself, "There are samosas." I abandoned my coffee for a vada and a paneer pakoda. There were also wilting cheese sandwiches and pastries. The journalists tucked in with gusto, going back for seconds. It's always the journalists. "May as well get a meal out of it," they say. Hey, I'm not judging, I'm the same way with alcohol. As soon as they break out the free drinks, I am by that bar. Still it's okay to feel vaguely superior to people who are super excited about a random pineapple pastry, she says up on her Cheesecake Is The Only Way high horse. So that was my brush with politics this week. I figure you can't live in this city forever without going to at least one of these events. "If you like that," says my mother, "I'll get you an invitation to the President's Independence Day tea party." Um, more pineapple pastries? Count me in. Whatever else your shallow political leanings are, it is a huge blow to womankind to see that you respect 'Madam'. The fact that you are unable to address her by her real name, and instead choose to fawn over her like a typical sycophant. It is extremely sad to see that your role model for a strong woman is one who basically 'married up' and be gifted a position of power. Furthermore, she was extremely reluctant to even become an Indian citizen. She has attained this level of power due to the stupidity of this country's citizens, and nothing of her own ability - and this is the kind of woman that you choose emulate. A sad, sad day for womankind. If this woman has so much power - how is she not able to use to to change the attitudes, mindset and governance this country to prevent other women from being raped, stalked, murdered or attacked with acid? Disappointing. I will be sure to tell people not read your books, as clearly you are just another minion beholden to power. I have watched Despicable Me..and minions are CUTE. And Wicked. And can blow raspberries at dissenters so MINION AWAY I say. You know, I actually like Sonia Gandhi. Corrupt as hell, but then all these politicians are. Anyway, I'd rather have her as prime minister than as the puppet master behind manmohan's strings. A tale of politics, self-serving interets and dunno what with these politicians. I got nothing against Dr Singh or Sonia Gandhi but feel all politicians are the same. Any day Manmohan Singh over Modi till the latter doesn't show his secularism in a honest manner. I like the style of your writing... i enjoy reading your articles. Keep it coming ! i didnt complete it but when you so lightly tossed of support for madam.. about the poor madam making in this poor country... i had to stop. If you cant do full justice to analysis you shouldnt be writing about it. Please be informed. When the blame for sending India to dogs would be pinned on those poor,illiterate masses who elected corrupt political parties again and agin, remember,there were literates like you who fawned on Madam's dressing sense. Have you heard of that banned book'the pink saree'? madam has allegedly claimed in that book that only servants speak Hindi. And these two links are the reason why 'poor madam'decided to stay in India.Both from the blog 'mediacrooks'. And we do have honest, non corrupt options for this pathetic excuse of a political party running the show right now. Self-serving interest and dunno what with these politicians. I got not anything against Dr Singh or Sonia Gandhi but feel all political leaders are the same.Nice blog.